BOU HSC Admission Circular 2019. Bangladesh Open University College Admission Academic Session 2019. HSC Admission Circular Publish on official website bou.edu.bd. So, Bangladesh Open University HSC Admission Circular 2019 Details and Application Process Can be found Through this post. Bangladesh Open University HSC Admission Circular 2019 Has been Published. Interested Candidates are requested to Apply within Deadline. We Know that a Large Number of Students Waiting For Publish HSC Admission circular 2019 For BOU. Candidates have To Fill Up Application last date 30 May 2019. Bangladesh Open University Students So Many Problem During Admission in Any Course of National University Bangladesh. 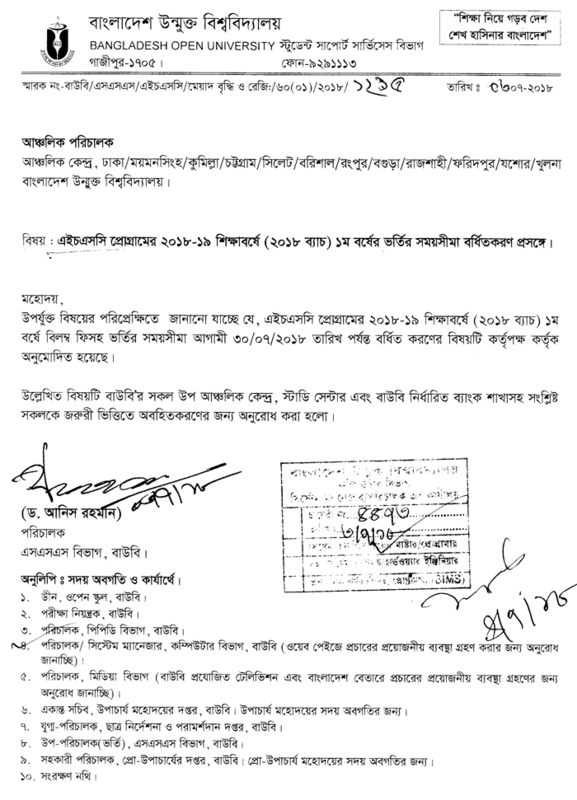 So, Reduce Session Jam, Combined With Batch, and To Fixed Exam year, The Authority of Bangladesh open university Take Session to This Admission Circular. Bangladesh Open University HSC Admission Candidates are Request To Fill Up Application Form Within 30 May 2019. If You Failed To Fill Up Application Form Within Deadline. You have pay Extra late Fee. Students have to collect the Admission Form from Regional Resource Center, Coordinating Officer or Study Center of BOU for BDT. 100/-. Students Also Can Collect the fo them from the internet but Registration Fee Must be pay at Regional Centers You can also use the photocopy of the form. Please see below for the list of Regional Resource Centers, Coordinating Officer or Study Center of Bangladesh Open University. Payment can be done by Bank draft or Coordinating Officer. Maximum 400 students will be admitted to a study center. First come, first serve procedure will be followed. One Study Center Can Admission Up to 400 Students. Over 400 Students Will Not Allow From any Study Center. Selected Candidate have to Present Physically and Have to admission. You have to pay BDT 3760 Taka For Admission Charge. Bangladesh Open University HSC Admission Circular 2019 Can be Download From Above Download Link. Hope You like The Post About BOU HSC Admission Circular 2019. Visit Our Admission Page To Get More Admission Information All Admission Circular.